Instantly Transforms Any OPI Lacquer to Matte! 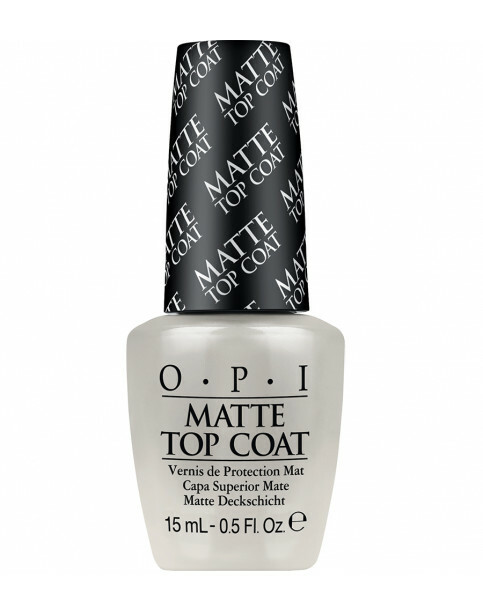 Matte Top Coat provides sealing protection, without shine and protects nails from chipping, making manicures last longer. With a matte, transparent finish, Matte Top Coat is designed to leave nails velvety smooth and creates a touchable texture for an edgy appearance. A matte finish can be worn over any OPI nail lacquer shade and should be applied after the base coat and primary coats of color for maximum effect. OPI Matte Top Coat is rated 3.7 out of 5 by 3. Rated 5 out of 5 by Ushi from Best Matte Top Coat I have been using this matte top coat for long time, its the best matte top coat to give matte finish, its lasts for longer time. It's my favourite! Rated 5 out of 5 by Morrigan from My favorite matte topcoat When I got my nails done at the salon they used this and it was awesome so I bought one for myself, I use this every time I want to make my nails matte, it works great. Rated 1 out of 5 by miss know it all from Top Coat I should of read the description of this product, this top coat takes the shine of the beautiful nail colour and makes the nail vanish look dull.